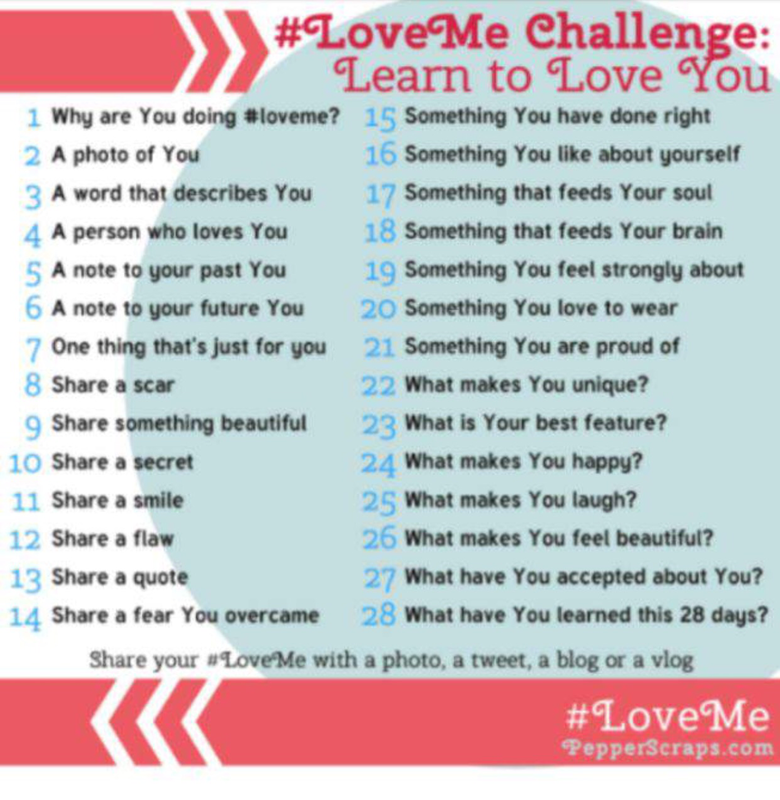 Today is my third and final installment of my “Three Day Quote Challenge”. If you missed the previous two posts, click here and here. My choice for today is one that I found and favourited a little later than the previous two days, but I love just as much. A lot of the reason I love quotes is because they put into words thoughts and feelings I’ve always felt or believed, in a concise, pretty fashion. This quote in particular really resonates with me, as I feel like it describes me perfectly. I always feel things big. If I’m angry, I’m really angry. If someone hurts me, it lasts for a long time. If I like someone, I’d go to the ends of the earth for them. 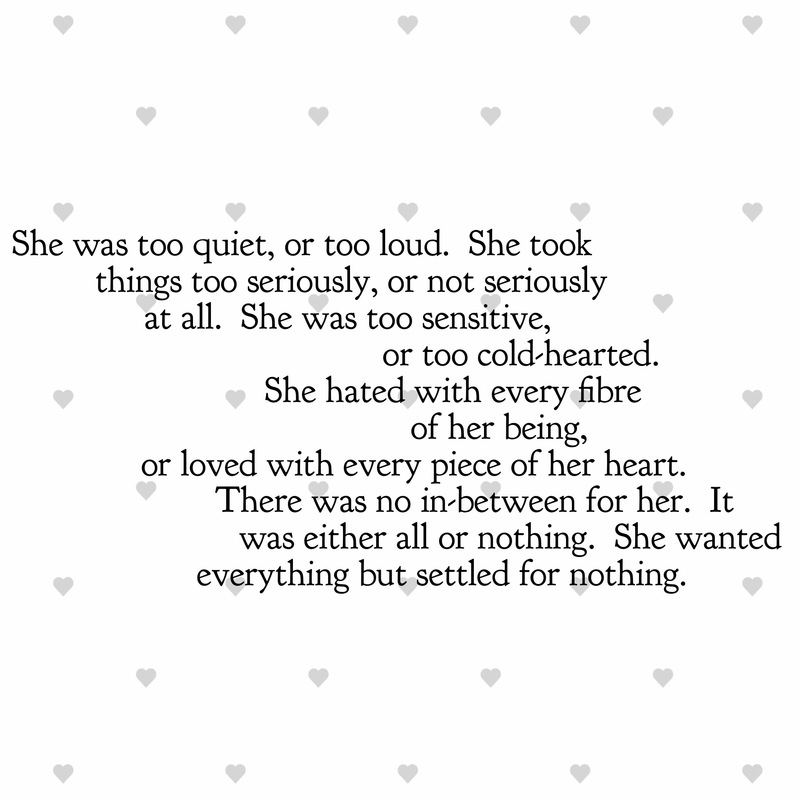 The last line also hits very close to home, as I do allow myself to settle when I shouldn’t. I’m slowly starting to learn that it’s okay to fight for what you want…in fact, it’s expected. It’s taken my whole life to start to understand this though. I always thought it was impolite, rude, too hard or not worth doing. Now, I’m trying not to let people bring me down. If they aren’t willing to help me reach my dreams, they can get out of my way. If I’m always trying to please other people and play by their rules, I’m never going to get anywhere. My last job is a great example of that – five years and I had barely achieved anything, career-wise. Not because I’m not a hard worker, but because it was easier for everyone to give me excuses why a promotion couldn’t happen “right now”. Ultimately, I’m sure it came down to cost, and the fact I wasn’t fighting hard enough meant that they assumed I’d just do the extra work for nothing. That won’t happen again. It can’t. As usual, if you have time, check them out! So, I’ve been nominated for the “Three Quote, Three Day” Challenge. I’m not sure if that’s the actual name or whether it’s just gotten lost like Chinese whispers but anyway, you get the idea. One quote a day for the next three days. This has probably been my favourite nomination so far, mostly because my phone is stuffed full of quotes that I’ve screenshotted or saved. Now I have to narrow it down to my top three! It’s made harder because it depends what mood I’m in. My favourites change constantly. Before I get too lost trying to pick one, I want to thank the very talented The V-Pub for the nomination. If you’ve got a spare couple of minutes, check out his blog. It’s great! Anyway, today’s quote I’m posting is this. There is a couple of reasons I chose to post this. Firstly, I love that it’s so simple yet so true. When we’re little, we’re told stories of superheroes battling baddies and saving the world, all without fear. While that too is courage, it isn’t real. Plus, if you had magic powers like that, you probably wouldn’t be too terrified. So I guess it actually isn’t all that courageous at all. 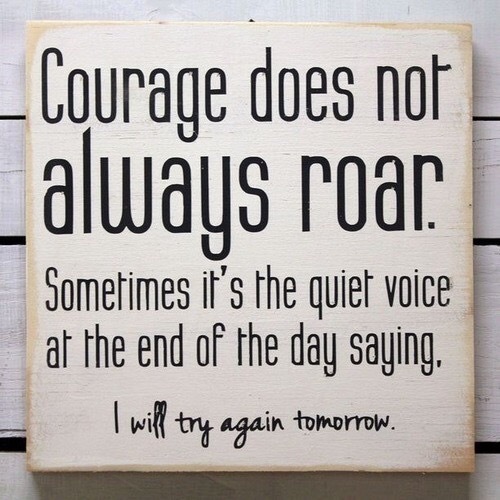 No, the best kind of courage is when you’re stuck in a terrible situation/event/drama and all you really want to do is run away, or build a pillow fort and hide in it with a scribbled note in pink crayon stuck to the doorway “leave me alone!”. Instead of doing that though, you get up out of bed, pull on your shoes and face the issue with a brave face and a strong mind. 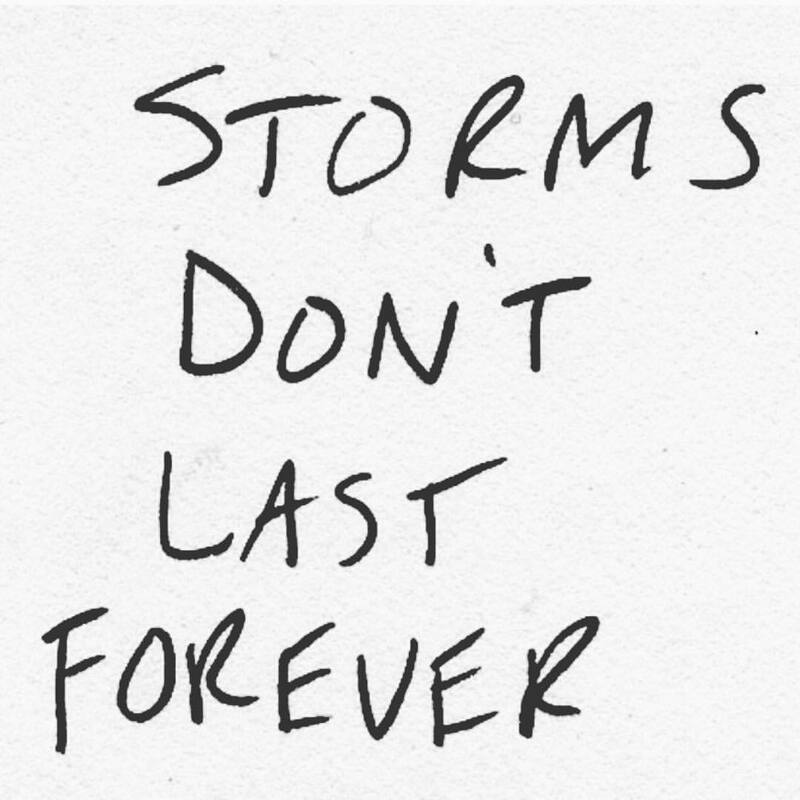 You get through it. You survive it. It doesn’t matter if it wasn’t fun, or if it hurt, or if you wished it had never happened. The fact that you got up and got through it is courage. It’s admirable. It’s brave. To anyone who has done that today, or yesterday, or anytime – you rock! 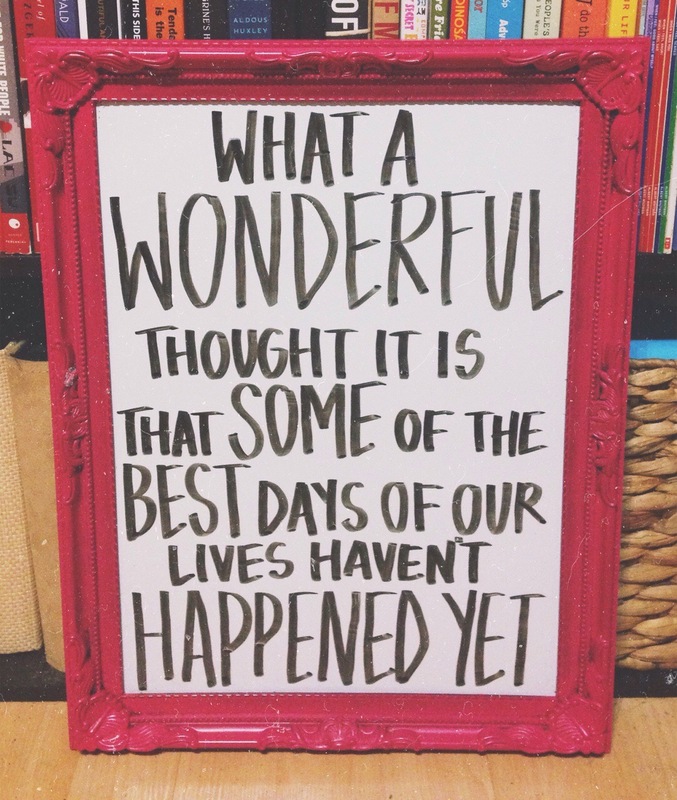 And to anyone having to face it in the future – you can do it, I know you can. The second reason I chose this was because it seems appropriate. It’s the first quote I put on my Instagram account and the first quote I set as a “favourite” in my iPhone. And now, it is the first quote posted in this challenge. The second part of this challenge is to nominate 3 bloggers. As I’ve seen one blogger just do three and leave it at that, and another do three per day, I’m not sure which is correct (again, Chinese whispers happening). To make it seem more matchy-matchy, I’m gonna run with three per day. I love giving shout outs to different blogs, so this works okay for me. I was nominated by startwithsparkles a little while ago (thanks heaps!). 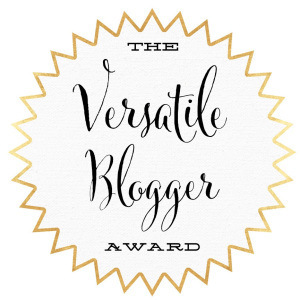 Any sort of award or recognition is always a nice surprise, especially since this blog is relatively young compared to most people’s. The basis of this award is simple – write seven facts about yourself, and nominate fifteen people who you think deserve this award. If you want to read up on it some more, click here. 1. I’m currently sitting on my comfy couch in comfy clothes, watching a rerun of Bones (one of my favourite shows ever), loving that it’s a Tuesday but I don’t have work because it’s a public holiday. Yay for getting paid today to do nothing! 2. I hate chores just as much as I did when I was fourteen, and I still avoid them at all costs. Today, I have washed the dishes, mowed the lawn and washed the bedsheets. That is some kind of miracle for me! 3. Today, I placed my first ever order for Lite N Easy. At the moment I’m just doing dinners, and I’ll just eat healthy for breakfast and lunch. I’m surprised by the versatility of the menu options – coming from a fussy eater, that’s a great thing! I’m just hoping the food tastes good and not like frozen dinners usually do. 4. A house is slowly being built next door to mine, and it’s actually quite educational. I’m seeing how an empty lot turns into a house, one step at a time. Given I’m going to be building my own soon, this education is going to come in handy! 5. I’ve only started drinking alcohol within the past year, and I’m only beginning to learn what drinks I do and don’t like. My new current favourite is Strawberry Midori. Mmmm, so good. 6. I can’t even deal with the fact Christmas is a month and a half away. Didn’t 2015 just start? 7. My absolute favourite thing about summer is the smell of BBQs in the evening. It reminds me of childhood, and trips to Bunnings, and all sorts of fun gatherings that I’ve been to which involved standing around (or near) the outdoor cooker. Plus, BBQ’d meat always tastes better than cooking it normally. Always. I love practical jokes and am always the mastermind behind them! These are my best two, though I have heaps more that could easily be listed instead! The best practical joke story I have happened about three years ago. My then-housemate and work colleague had just signed up for a new phone, and she was so excited about it. It was her first Samsung after coming from iPhone and she was over the moon about it. She treated it like it was her baby. She didn’t have a passcode on it, so it was a practical joke begging to happen. She’d left it out the back at work, and so we decided then was the perfect time to prank her. We downloaded an app that made the screen appear to be broken (it looked pretty convincing). Then we called her into the back office, poker faces in play, all looking upset and guilty. Someone told her that her phone had fallen off the shelf when it was charging. She flipped out. She was stressing out and close to tears and asking how it could have happened. It went on and on, with it getting harder and harder not to laugh. Finally I cracked, I couldn’t keep a straight face any longer. When she was told it was a joke, she laughed but was really angry too (as most joke victims are). She was very relieved her phone wasn’t broken. Ironically, about a month later, someone dumped their heavy bag on her phone at work, and the screen actually got broken. She didn’t believe it at first, assuming it was another joke, but it wasn’t. That made us feel a little guilty! My other good practical joke story happened last year, again at work. My two best work friends had gone to get coffee and they sent me a selfie of them halfway there. I decided payback was in order as they didn’t invite me with them. I emailed myself the photo, printed it off about 30 times, then stuck it all around the back room, including in the safe, in the fridge, on the microwave and on the roof. I had to do it quickly as I knew they’d be back at any moment. Luckily the back room was tiny so 30 copies basically covered everywhere. They walked back in and only noticed one of them at first. They were confused as to why I’d printed it, but didn’t say anything. Then suddenly, another one caught their eye, and another, until suddenly they realized they were staring at themselves all over the room. Everyone else taught it was hilarious, and they spent the next five minutes taking all the pictures down. What’s your best practical joke? This prompt, and many more, can be found here. The last game I played was my lifelong love, the Sims. I was introduced to the game when I was about twelve, and I’ve never looked back. One of my favourite childhood memories was playing the Sims 2 when I first got it. There were so many amazing new features and adjustments from the original game and my sister and I spent hours exploring it. There are always families you make that stick with you. For TS2, it was Hayden and Alyssa and their brood of offspring. As TS2 didn’t allow for the whole neighbourhood to age up simulatatiously (that was introduced in the Sims 3), I spent many hours playing Hayden’s family, then Alyssa’s. I started with Hayden’s parents. I saw them meet, fall in love, marry, get pregnant with him then his siblings. Then I played Alyssa’s family and oversaw the same progression. As these were some of my first families that were able to age up (the original Sims didn’t have an ageing feature), I got very attached to the families. When I finally got Hayden and Alyssa to meet and marry, I was so happy. It had taken so long to get the two families to become one, so it was really special. They had kids, and I played through them too. Anyway, I digress. The game I played most recently was the Sims 3. I have the Sims 4 but I just don’t like it. I don’t like that the neighbourhoods are segmented, that it doesn’t age together, that it’s so complicated to get job promotions and romance happening. I just feel like it’s a lot of hard work. I especially don’t like that everything seems to have taken a backwards step – the babies are attached to their crib (the Sims 1 did that! ), the neighbourhood doesn’t age together (the Sims 2 was the last to do that), no toddler age – my favourite age group (the Sims 1 was the first and only game prior to skip this). This is why I’ve stuck with TS3. It has massive amounts of expansion packs, custom content and is basically the best of all the games combined. As I’ve played the game for so long, I’m always on the hunt for different ways to play. The family I’m playing right now is the Johns. I started with Aubrey, a young adult. I put her on a vacant lot, used a cheat to completely wipe out her funds, and sent her to go fishing. The only way she was allowed to earn money was from making it herself – she wasn’t going to get a 9-to-5 job, but she could do things such as fish, paint, write or steal. For a long time, her day consisted of fishing from mid-afternoon to midnight, then inviting herself over to a random person’s house, then stealing 3 items from their house (as a kleptomaniac, she could steal 3 items every 24 hours, but I can’t control what she steals, only who she steals from and what room it’s taken from). Slowly but surely she started to build her funds, and her house. At first she was forced to used her local gym for toilet and shower usage, and she’d nap on one of the couches there. She’d buy fruit and vegetables from the grocery store and snack on that. It was great when she was able to afford things such as a bar fridge, toilet and bath. It was even better when she could afford to build walls so she didn’t have to live under the stars. Her whole young adult life was focused on building up her money and house. When she aged up to adulthood, she had a small house with a few rooms, and a little bit of money tucked away. She was driving a flashy car that she’d managed to steal, so that was nice. The second part of this family challenge was she was to adopt all her kids, not get pregnant. I did this as I’m so used to the old meet-marry-reproduce routine that I decided I wasn’t going to do this any more. I also decided I’d use coin flips to decide the gender and age of the kids she’d adopt, and I’d use babynamegenie.com to randomly pick a name for them, as I liked in TS2 when you’d adopt, they’d come pre-named (something that doesn’t happen in TS3). To add to the rules and to tie into the first part of the challenge, she had to have enough money to be able to give each adopted child their own bedroom. She adopted her first – Logan, a toddler-aged boy – a few days after her birthday. It was a lot of fun, though challenging, as she still had to fish and steal, along with teaching him how to walk, talk and use the potty (oh, that’s another rule too – all adopted kids must be taught the basics!). She managed it though, even if it meant she was almost always in a constant bad mood and state of exhaustion. After Logan aged up into childhood and went off to school, Aubrey adopted another boy, this time a baby named Owen. This was an even bigger challenge as not only did it mean he was really young for longer than Logan was, but he needed care around the clock. Aubrey began skipping her fishing trips more often, though still kept up stealing which was the higher-income-generator of the two. After Owen aged up and was taught everything, Aubrey adopted Quincy, another male toddler. Having two toddlers and a child and very little money was definitely tough, but I tried to get her back into fishing as much as possible. On top of that, I also had to get her too cook dinners for Logan (she’d been living off quick meals until then but kids get hungry a lot more quickly with those). The house was filthy with rubbish everywhere but she just didn’t have enough time to clean on top of everything else. It was great when Owen aged into a child as it took the pressure off Aubrey a little bit. She taught Quincy everything, and stole some quality stuff so she could afford to upgrade her house a little and build another room. From there, she adopted her first daughter, a child named Tess. It was great to finally adopt an older kid, as it’s a lot less work. It meant that Aubrey could focus on fishing a lot more, and she soon had a lot more money than she’d had for a long time. She then adopted a toddler named Boston. Thankfully Logan was now a teenager, so he was a great help with the latest addition, and between the two of them, Boston was taught the basics very quickly. The family was starting to really take shape and get everything together. The kids were doing well in school, the money was flowing in steadily, everyone was in good moods. Aubrey didn’t adopt any more kids for awhile, focusing instead on juggling the family she already had, earning extra money, cooking meals to feed all those mouths and keeping the house clean. It seemed like her life was finally becoming easier and less of a struggle. The kids all started to age up, they got good grades and had friends in school. After awhile, Aubrey decided to welcome her final two additions to the family, two children – a girl named Rachelle and a boy named Shaun. The house was at bursting point, but Aubrey didn’t want it any other way. She achieved her lifetime wish of “Surrounded by Family” and aged up into an elder. Currently, all the adoptees are teenagers. Three of them are dating, all of them are doing well in school and the house (which started from an empty lot) is now 13 rooms big. As per the challenge, each kid has their own room. They’ve each got a desk in their room, and a bookshelf. The family also found and adopted an unicorn named Pepper, who is a fantastic racehorse and super pretty. It wanders around the neighborhood at will but always comes back to eat and sleep. It’s a crazy household but it’s been a great challenge and is definitely different to how I usually play! My favourite moment so far was when one of the boys accidentally set the kitchen on fire. Fires are always dramatic in this game, and it spreads pretty fast. All the household runs towards the fire (logic, right?) and stress and scream and basically just get in the way. Well, Boston got too close and went up in flames. Luckily, being a child-friendly game, he casually walked out of the flames, got his sister to extinguish him and he was good as new. 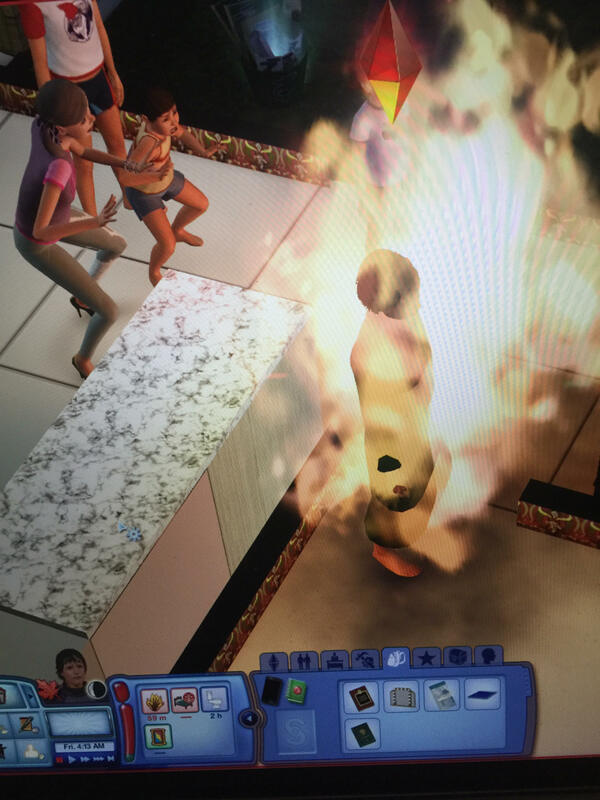 It was a stressful moment though as I don’t like any of my simmies to die! 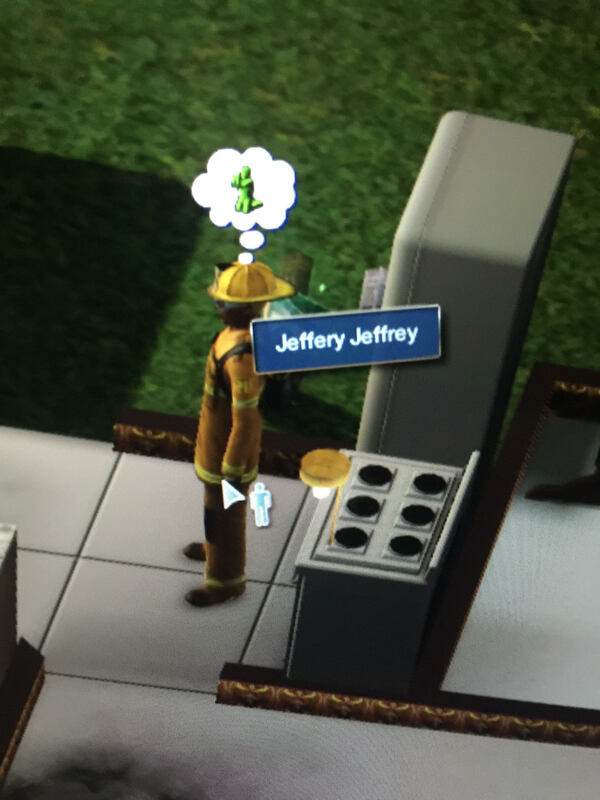 After that happened, the fireman rocked up, and his name was Jeffery Jeffrey. That’s one of the more amusing names the game has randomly generated! Do you play the Sims? What’s your favourite family? Day 22 – What Makes You Unique? Another very broad statement. I feel strongly about a lot of things. In fact, I’m sure my tangents drive people crazy sometimes. What I feel strongly about today though is something that has divided nations and dinner tables everywhere. We’re all firmly on one side of the fence or the other. It’s a controversial yet oft-spoke about topic of debate. 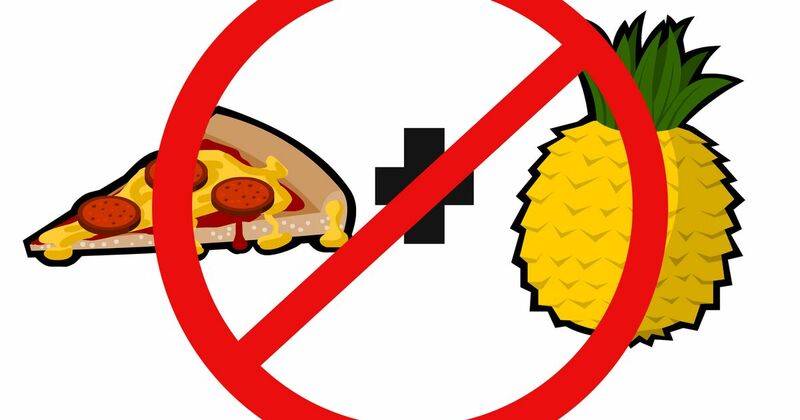 Pinapple does not belong on pizzas. There, I said it. Fruit should not be touching my ham and cheese deliciousness (I know, I know, except for tomato, which is technically a fruit but is also an honorary vegetable in this instance). Fruit should be kept until after the meal! As a dessert, preferably in pie form. 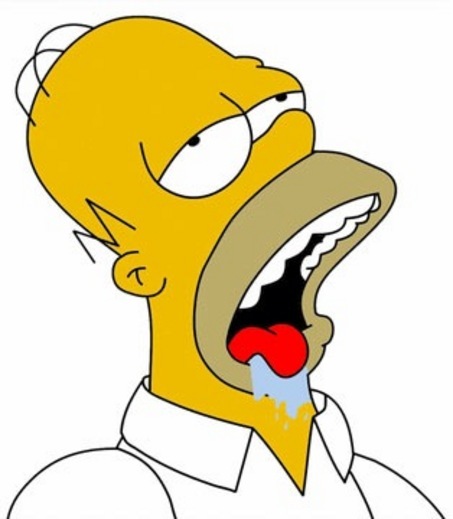 Mmmm, pie. For those firmly on the opposite side of the fence, don’t tell me to just “pick it off”! Pineapple is juicy, everyone knows that, so just because the little yellow devils aren’t on the bread any more, doesn’t mean we can’t still taste that it was there! Way to ruin a good pizza, Hawaiians! What side of the fence are you on? PS Yeah, I skipped yesterday. Sorry. Just picking up where I left off again! I think the best thing to feed my brain is reading. It’s something I don’t do anywhere near enough of, but I can feel myself getting smarter (or at least, some of my smarts returning after magically disappearing once high school let out). It’s something I did religiously as a kid. I always had stacks of books waiting for me from the library, and I’d devoure story after story. I remember I started with Grug as I was just beginning to read, then moved to Goosebumps and the Baby Sitters Club. When I was a bit older I got into the Mary-Kate and Ashley books, then John Marsden’s the Tomorrow Series. Then someone introduced me to the Sims and suddenly reading wasn’t so important any more. I got back into it a couple of years ago, re-reading the Artemis Fowl books (which are awesome! ), then getting lost in the back catalogues of Catherine Ryan Hyde and Jodi Picoult. I finally got into Harry Potter as well. So many wonderful stories and characters! As much as I love video games and cartoons, nothing makes my brain tick like a good book. I really do need to make more of an effort to keep reading. It’s so easy these days to chuck on the TV instead.